Difficulty: Fairly strenuous – a number of comparatively steep climbs and descents. Large sections without shade. This is, exceptionally, a linear walk. It had been intended as circular but an unexpectedly hot day meant that we were forced to abandon the final return leg back to Platania. We explain below how that can be achieved. The experience itself is a salutary lesson about walking in unexpectedly hot weather! 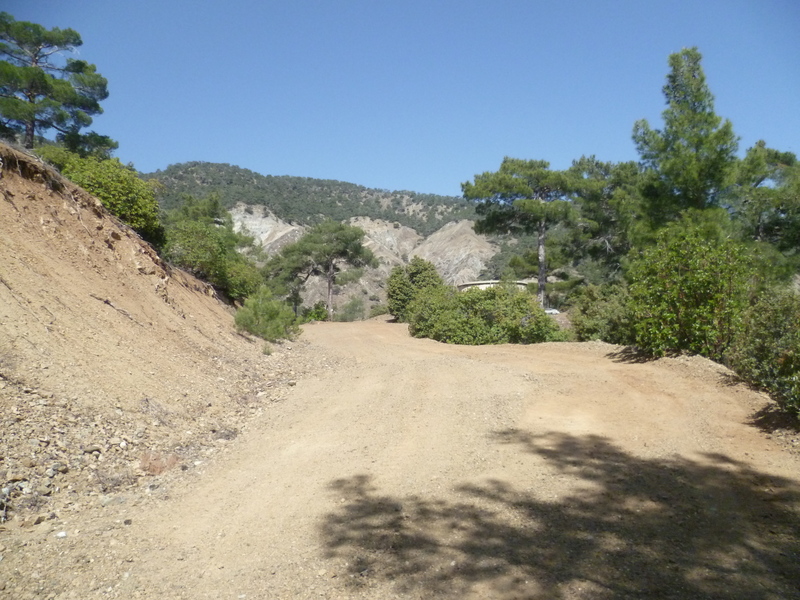 … you will be able to drive down a small road for 50 metres or so to park up at the picnic site. Stay on this earth road as it heads up past camp buildings and gradually winds its way around the side of the mountain. This is a fairly steep climb with little shade and (as we found out to our cost!) can be hard work on a hot sunny day. 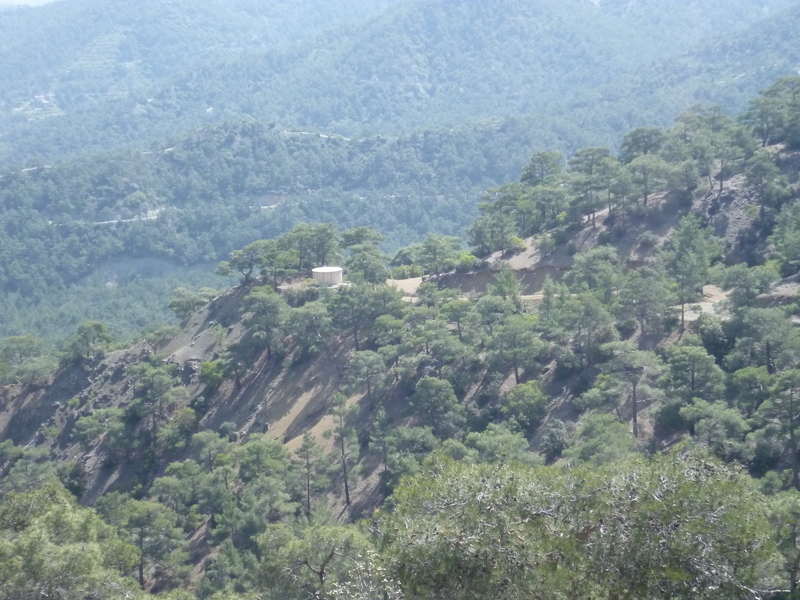 After 20 minutes you will pass a large circular concrete water tank on your right and, as your climb continue along the south side of the mountain, you will be able to look back down towards it and see how far you have come. 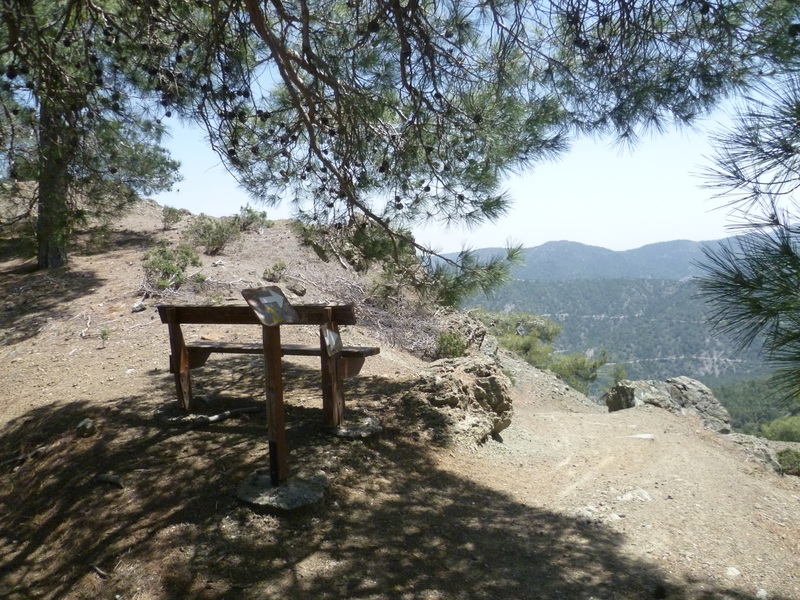 There are also more picturesque views to be had across the valley towards Kakopetria and beyond to the sea. After about 45 minutes the earth road narrows into a walker’s trail and begins to climb more steeply up the side of the mountain. 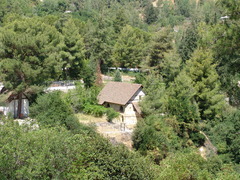 Intervals of contour walking are interspersed with bouts of challenging uphill walking, although there is now at least a degree of shade from the trees. 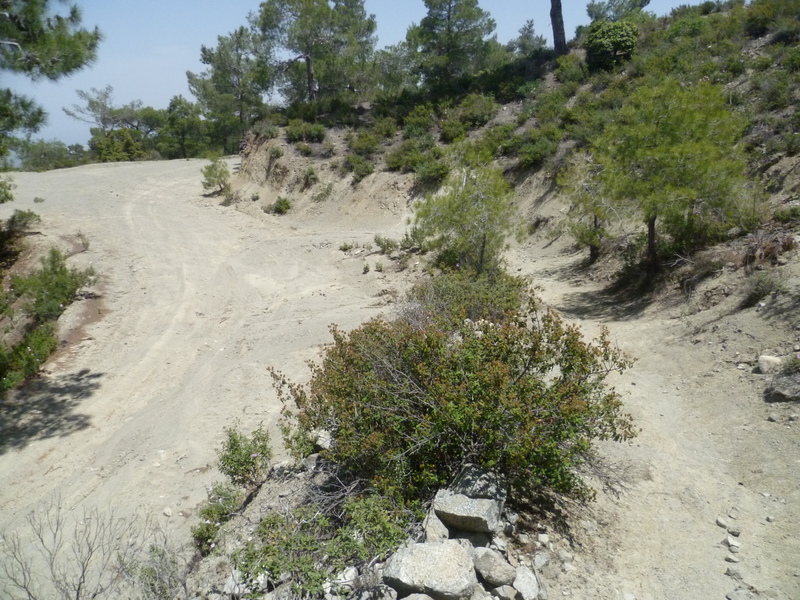 Although you are still on the E4 there are, unusually, no signs on this section of the walk – there is, however, no real possibility of going wrong as the trail is clear. Take the left turn which is signposted to ‘Troodos 5.5 km’. 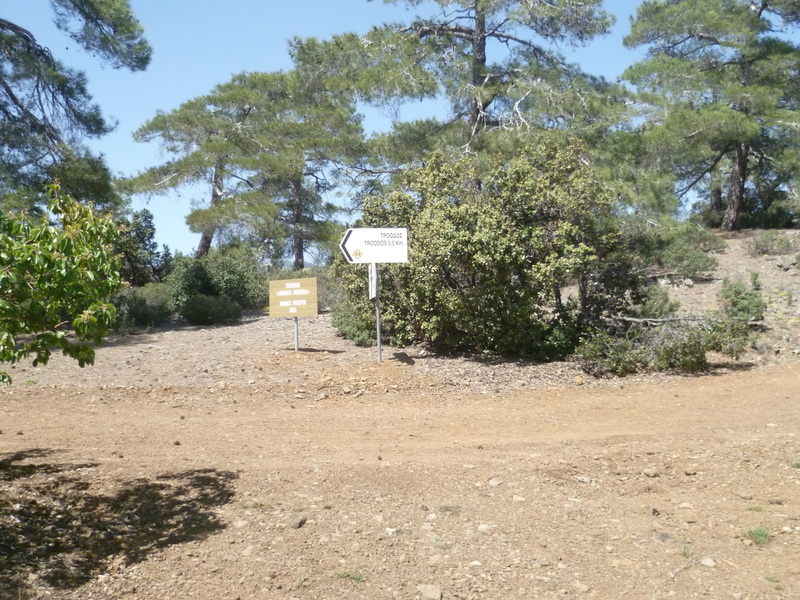 Within 3-4 minutes you will come to a further signposted junction and this time you will need to take the right-hand turn towards ‘Kakopetria 5km’. 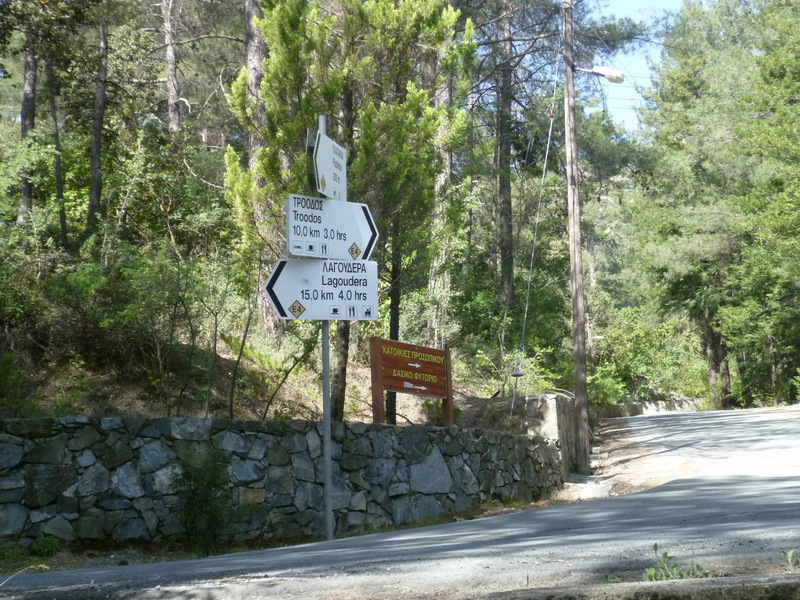 You are no longer on the E4 and are now heading downhill towards Agios Nikolaos tis Stegis. …and as you head down into the valley your leg muscles are tested by a track that descends, quite sharply at times, through rocks and loose scree. High levels of concentration are required if you wish to stay upright! We found that the major part of the descent from the bench in the photograph above took almost an hour, so it was approximately 2 hours 55 minutes by the time the trail reached a wider earth track. At this point the descent continues to the left, passing by a series of water towers and, almost immediately afterwards, a signpost at 3 hours. 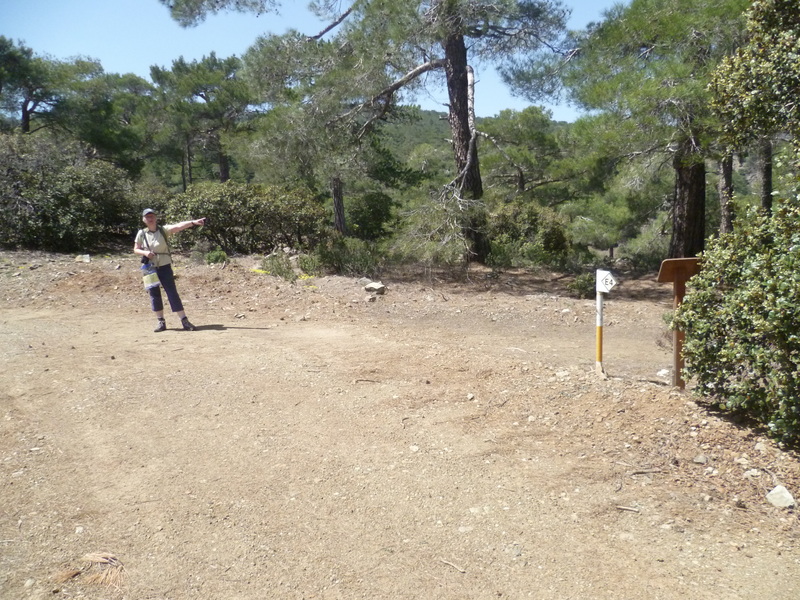 … and at 3 hours 40 minutes you will arrive down at the tarmac road (F936). From here it is a short five minute walk up the road to your left to arrive at the church itself. In what turned out to be a fairly ill-fated walk we had by now drunk a large amount of water as the May temperature had unexpectedly soared throughout the morning. Having visited Agios Nikolaos before, we were well aware that water bottles could be refilled there. Only as the church hove in sight did we suddenly remember that we were walking on a Monday, a day on which Cyprus antiquities are generally closed. And so it proved. 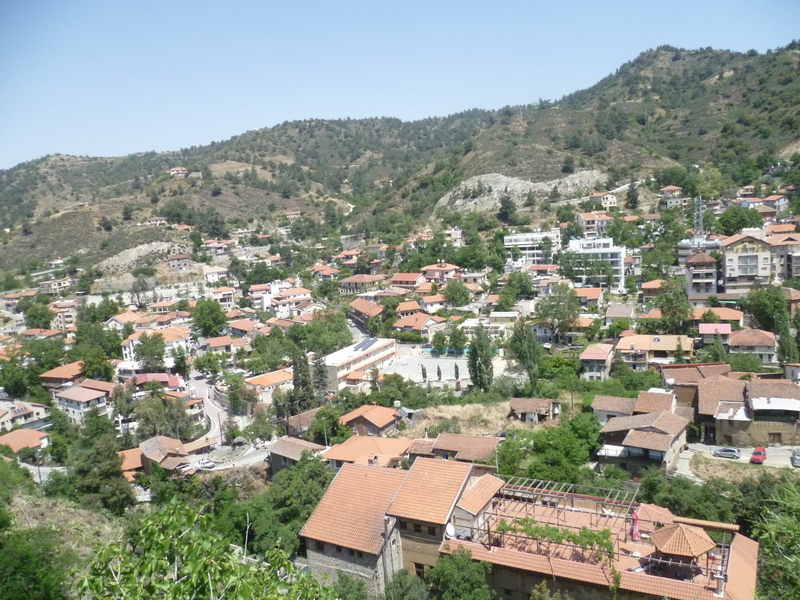 The church was shut, there was no opportunity to obtain more water and our original intention to climb back up a separate 10 km-long walking trail beyond the church to Troodos Square now looked daunting. At this point, and with the heat increasingly oppressive, the original circular walk was abandoned. Instead, the walk now continues from the point at which the F936 was first reached. 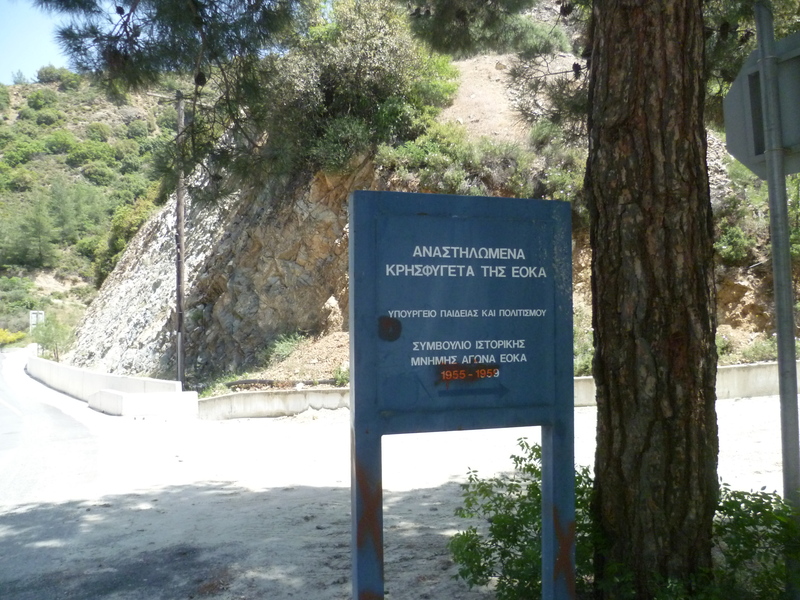 There is a sign there pointing back up the trail to some EOKA hideuts. Turn left onto the F936, walk some 50 metres up the hill and, on a left-hand bend, take the side road to the right. This is Pampakias Street. 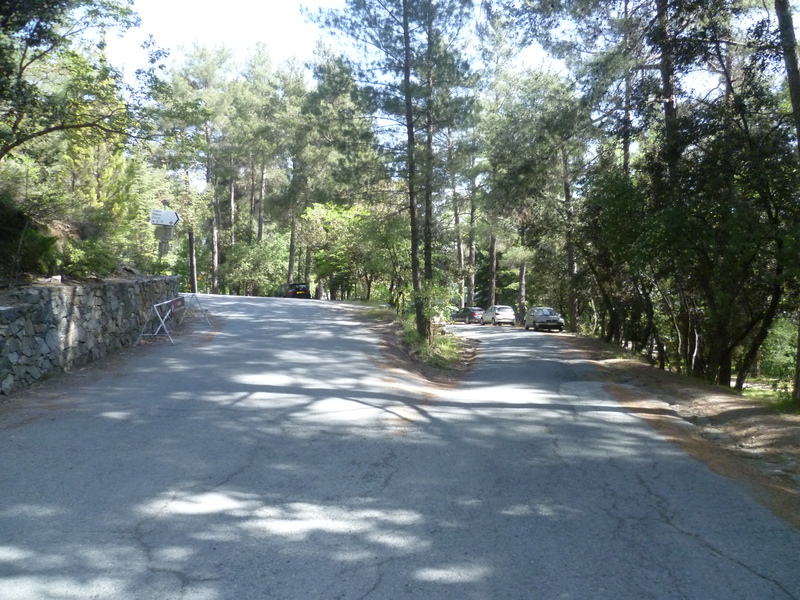 Follow this very quiet country road as it winds its way towards Kakopetria, becoming Pitunis Street and, as Kakopetria appears sprawled below you, Demetrios N Hamatsou Street. You will need to take a turning to your right in order to walk down into the town itself. 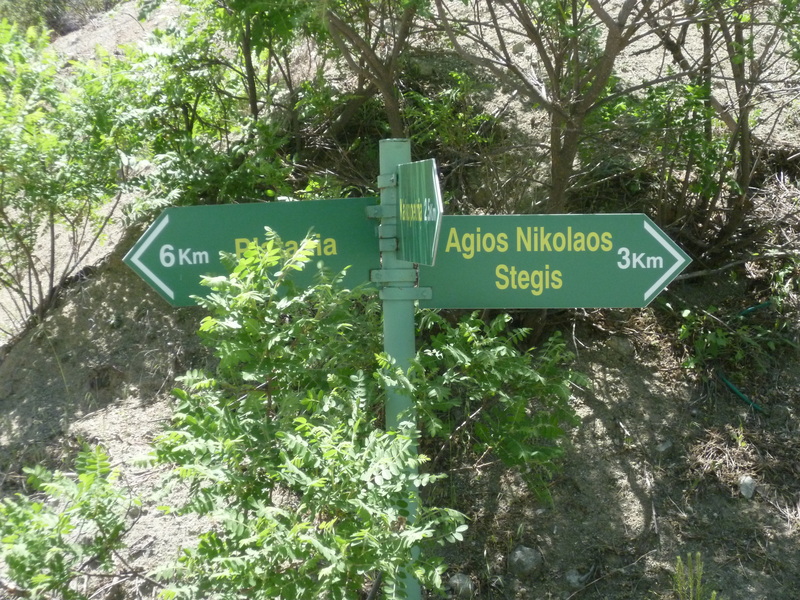 It doesn’t particularly matter which one you choose – we selected a junction beyond the church below opposite a sign to Agios Paraskevis Street and, after 4 hours 20 minutes arrived on the main street in Kakopetria opposite the Rialto Hotel. Walking down the main street towards the central square we drank the last of our remaining water and simultaneously noticed an electronic building sign displaying a current temperature of 37 degrees! At this point we walked to the main square (4 hours 30 minutes) sat in a café and had a further look at the map! 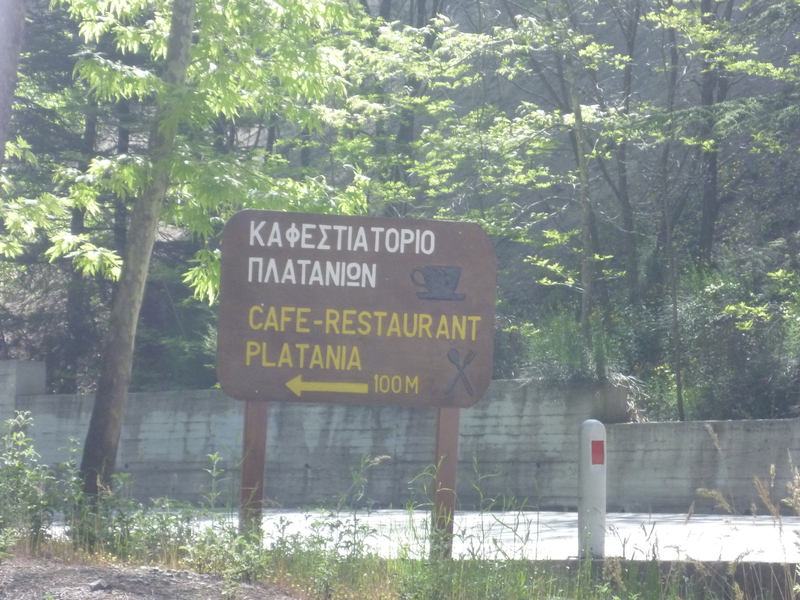 We had already identified a route back to the Platania picnic site – a trail running off the F936 – but with the unrelenting heat of mid-afternoon awaiting us and a further hike of around 2-3 hours ahead we decided that discretion was the better part of valour…the air-conditioned taxi back to our car was absolute bliss!